Posted on November 12, 2016 by Sandwich Learns Together/ SPS in Did you know? 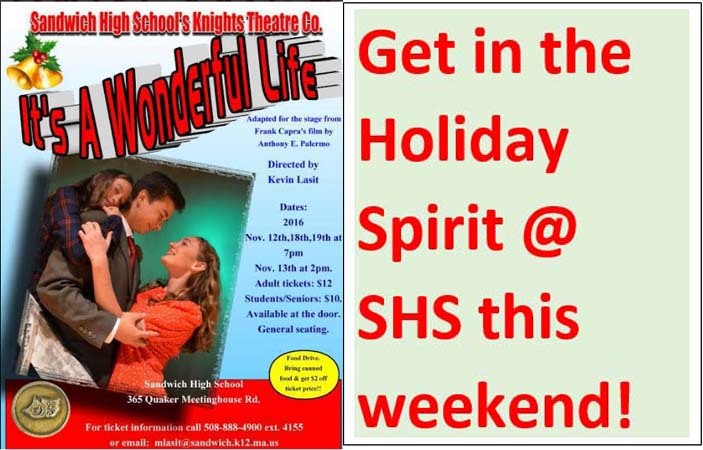 Our very own Knights’ Theatre Company is opening up their fall play – It’s A Wonderful Life. Starring over 60 STEM and Sandwich High School Students! Tickets are $10 for students and senior citizens, and $12 for adults. (See poster below). **Also, our Knights’ Theatre Company students wanted to do something to give back to our community, so they are holding a canned food drive for the Sandwich Food Pantry, please bring non-perishable food to donate, and receive $2.00 off your ticket price!